A "labor of love" brightens fire station holiday greeting. Mike Unruh gets kind of choked up when he talks about the big mural he spent the summer repainting. It's sort of a family heirloom as well as a Mishawaka Fire Department heirloom. Mike's father, Lyman Unruh, was a Mishawaka firefighter who also had a sign business. In 1954 he painted the mural for the old Station 3 which was on both Eighth and Ninth streets at different times. 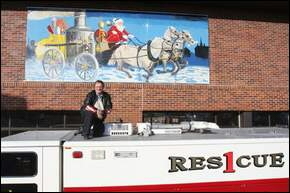 The 20-by-8-foot mural shows Santa on an old-fashioned firetruck. There are landmarks from old Mishawaka in the background. The former Uniroyal/Ball Band buildings are there. And the spire of St. Joseph Catholic Church is somewhere on the mural. Lyman Unruh went back and restored the sign in 1969. The mural later went to the central fire station and in 1991 to the Union Street station. Lyman Unruh retired from the fire department in 1973 as a captain and died in 1993. Firefighters have put the mural out as their holiday greeting to passers-by since 1954. By early this year it was getting pretty ratty. Cold, heat and road salt had taken their toll. But Mike Unruh just couldn't stand to see it be thrown away or not put up. "I get kind of broke up about it," he admitted. "I miss him (his father)." Mike remembers watching his father paint the mural. "I remember as a little boy sitting on a barstool watching my Dad paint this," he said. "It literally took months of days off." His father worked in an old barn behind Mike's grandparents' home at 538 Lincoln Way West. Mike took the mural, which breaks down into pieces, to the pole barn behind his home in Plymouth to do the work. "It was a labor of love," he said. "I worked Memorial Day until the first week of October, Saturdays, Sundays, weekends, holidays and if I had insomnia or something would hit me." Mike said he had to remember how to mix paints to get the colors he wanted, something his father was a master of. Those memories were what would "hit" him sometimes in the middle of the night. "I'm not known for my painting ability," he said. "I followed his outline." He made sure all eight of his grandchildren watched him working on the mural so a family memory of it will be passed on. Mike left his father's two signatures from 1954 and 1969 and added his own with 2007 beside it. The mural now adorns the south side of the Union Street station.